Jose Mourinho watched Serbia's Nations League win over Montenegro - but was he on a scouting mission? Jose Mourinho watched Serbia cruise to victory, while Bernardo Silva inspired a Portugal side without Cristiano Ronaldo as the Nations League resumed on Thursday. The Manchester United manager was in Montenegro as Fulham's Aleksandar Mitrovic double helped Serbia to a 2-0 away win over their rivals in Podgorica. Mitrovic converted an early penalty and scored again in the 81st minute to leave Serbia top of Group C4 with seven points. Portugal were also victorious, taking control of a competitive Group A3 with a 3-2 victory over Poland in Chorzow. Missing captain Ronaldo, Portugal secured their second victory from two, leaving Poland and Italy level on a point, but they had to come from behind. Krzysztof Piatek's header had given the hosts the lead but Andre Silva and Kamil Glik's own goal turned the game around, before Manchester City's Silva scored a fine individual goal to stretch his side further ahead. Jakub Blaszczykowski scored Poland's second in the 77th minute to ensure a tense finish, but Portugal held on for the win. 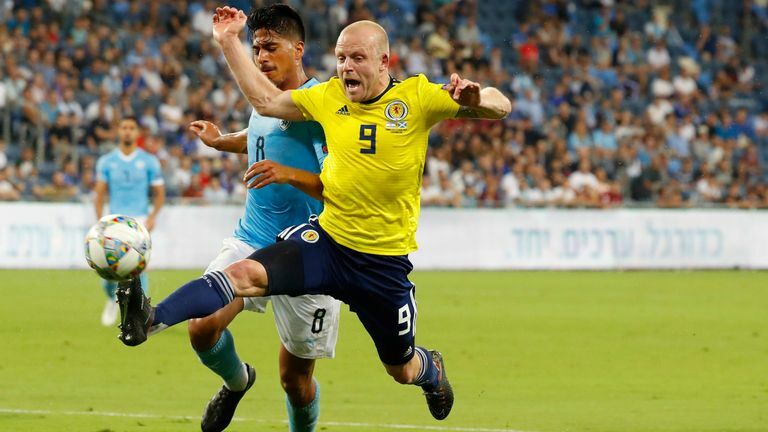 In Group C1, Scotland were reduced to 10 men as they lost 2-1 to Israel in Haifa. Charlie Mulgrew put the visitors ahead from the penalty spot in the 25th minute after a push on Steven Naismith. Dor Peretz's second-half equaliser was then followed by John Souttar being dismissed for a second yellow card, and Kieran Tierney's own goal sealed a home victory that leaves Scotland, Israel and Albania all level on three points. Elsewhere, Romania moved up to second in Group C4 after a dramatic late win against Lithuania in Vilnius. Alexandru Chipciu gave the visitors a lead they held until the 89th minute when Arturas Zulpa equalised. Alexandru Maxim then scored in the fourth minute of stoppage time to seal what had become an unlikely victory. Kosovo earned a 3-1 victory over Malta to stay top of Group D3 with seven points. Andrei Agius cancelled out Benjamin Kololli's opener but Vedat Muriqi restored Kosovo's lead and after Michael Mifsud was sent off following a second yellow card, Kololli struck again. In the same group, Azerbaijan's 3-0 victory away to the Faroe Islands leaves them second and their hosts third. Richard Almeida de Oliveira scored twice, the second from the penalty spot, either side of a strike from Dimitrij Nazarov. In Group B2, Russia and Sweden fought to a 0-0 draw in Kaliningrad. Russia remain in first place, with four points, two ahead of Turkey and three ahead of Sweden.